If you’re a sneaker lover or shopping for someone who is, then this is the perfect way for you to save money! And we aren’t just talking about sneakers here. They also carry everything from clothing, hats, & jackets to gloves & duffle bags! And the great news is, you can now purchase a Foot Locker gift card and save money on your entire purchase! If you’re looking for sneakers with a lot of style, then this is the deal for you! With your card, you’ll get all the newest and coolest gear for less money! Did you know this store has locations in 23 countries? It’s true! They are recognized globally for having a huge selection of the newest and coolest shoes and gear. What’s more, they have over 1,800 stores in the United States too. This means there is probably a store close to you! Furthermore, within 178 of these stores, there is a House of Hoops that offers premier basketball footwear and apparel. So, what are you waiting for? If you love the newest and greatest style of athletic gear, then you’ve got nothing to lose with this card! Well, except for high prices, you’ll lose those. Buy your discounted Foot Locker gift card today and you’ll look cooler than ever before while paying less! And remember, they even have departments in men’s, women’s, and kids! 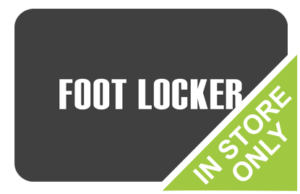 So, with your Foot Locker gift card, you’ll save money on great athletic merchandise for the entire family! And what’s more, they carry all the brand names you know and love too! Adidas, Asics, Jordan, New Era, Nike, Puma, Under Armor and more. Whether you’re a trendsetter who has to have the newest style sneakers or you’re just looking for a new pair of shoes, this is the deal for you! Not only will you save cash when you buy a discounted Foot Locker gift card, but Cards2Cash also offers many other great discounted cards! Just imagine shopping in the very same stores you know and love, yet paying less money! If this sounds good to you, then be sure to check out our listings for Nike, Famous Footwear, and Rack Room Shoes, DSW to name a few! Finally, you can sport the life you desire to live, without breaking the bank! Sell your gift card today! Do you have a Foot Locker gift card you aren’t going to use? If so, then good news for you! Cards2Cash will turn your card into cash! And that’s not all! We pay top dollar for gift cards for a variety of stores, restaurants, and even restaurants! If you’re tired of dragging around a piece of plastic and would like to have cash instead, then just stop in one of our retail locations and we’ll pay you cash on the spot for your card or simply fill out our easy online form and we’ll get back with an offer! Don’t forget, Cards2Cash is your one-stop gift card shop!